Wetherbee’s Charters includes all bait, tackle, fishing gear and high quality rain gear for your comfort. Our top of the line high quality fishing gear and custom fish fillet and vacuum packaging makes it easy to bring home the big ones. No hidden costs! We can accommodate up to 13 guests at our lodge. Our Charter Vessel is a North River 24ft -Jaqie’s Freedom, and our Captain Frank Wetherbee has over 20 years of experience. He can take up to 6 people out on the boat daily depending on each person’s weight. 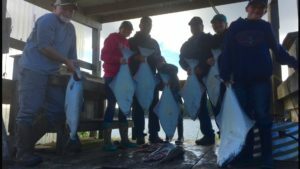 It is common to see larger groups rotate between a charter trip on the salt water and a self guided stream/fresh water trip. Throughout their stay, they literally get to see it all! It is not uncommon to fish the calm smooth inside waters of Clarence Straits without the large ocean swells from the outside waters. 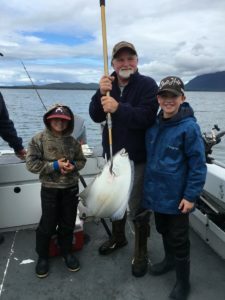 Our 8-hour minimum guided fishing trip can include coho, kings, halibut, and many others depending on the request of the fishermen. EXCURSIONS: Unguided fresh water fishing is also available for local trout, Dolly Varden, coho, sockeye and steelhead. Please click here to book your reservation today, or click here to ask us a question. Please click to enlarge any photo below.